February 5th, 2016. The official Digimon Linkz title site updated today with additional information about the game's Command Battle System. According to the site, each Digimon in the game will have its own Leader Skills, Special Skills, Inheritable Skills, as well as Attributes and Resistances. This description invites immediate comparison with Digimon Story Cyber Sleuth on the PlayStation Vita and PS4, which also uses CBS and implemented a system of Special Skills, Inheritable Skills, and Attributes. 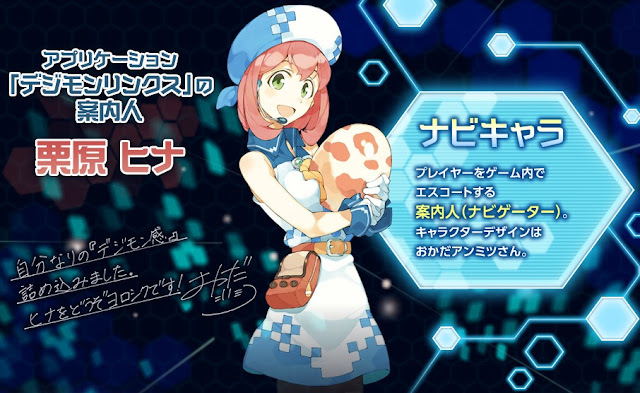 The update also shows off new key art of the game's navigator, Kurihara Hina, which was previously shown in an issue of AppliSoft magazine. Kurihara is designed by illustrator Okada Anmitsu. Her design includes a belt pouch shaped like an original Digital Monster virtual pet, with the zipper in the shape of an Adventure tag and crest. A space where Digimon live. 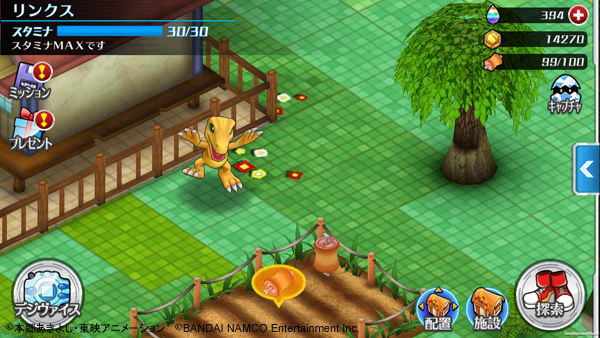 It's possible to build a wide range of facilities on the farm, not just for raising Digimon, but also for gaining the advantage in battle. The player challenges the recently-appeared "Digital World's strange phenomenon" using this farm as their base. Use the Digimon you raised in the 3 vs 3 Command Battle System! The Digimon each have their own "Leader Skills," "Special Skills, Inheritable Skills," as well as "Attributes and Resistances" to gain the advantage in battle with and carry on to victory. Linkz was originally announced for a 2015 launch, but was delayed tp 2016 due to production issues. More than fifty thousand people have preregistered for the game, and as part of its promotional campaign Bandai has set up a special LINE messaging account for it that sends information about the game to users' phones.